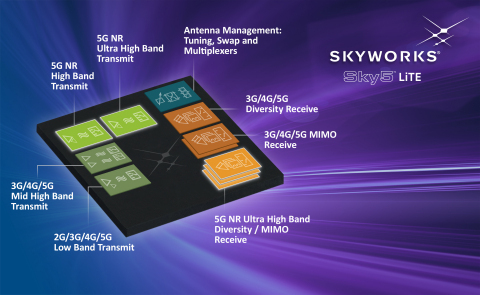 Skyworks Launches Sky5™ LiTE for Universal 5G Deployments | Skyworks Solutions, Inc.
BARCELONA, Spain--(BUSINESS WIRE)--Feb. 26, 2019-- Skyworks Solutions, Inc. (NASDAQ: SWKS), an innovator of high performance analog semiconductors connecting people, places and things, today introduced Sky5™ LiTE—the industry’s first fully integrated front-end solution for mass tier 5G cellular applications. With improved RF performance in a uniquely compact package, Skyworks’ newest device simplifies designs, enabling faster deployment. The baseband agnostic platform supports up to 100 MHz wide bandwidth of 5G new radio (NR) waveforms with flexible power management options—delivering high-speed network experiences with optimized efficiency and near zero latency. Targeted for mass markets, Sky5™ LiTE interfaces with all leading chipset providers and equips early 5G adopters with differentiated architectures for an open ecosystem – the favored approach when compared with closed, sole-sourced RF front-end products. With the recent introduction of Sky5™ Ultra for premium applications, Skyworks offers the most comprehensive 5G portfolio in the market. According to the Global Mobile Suppliers Association, 201 operators in 83 countries are investing in 5G mobile and fixed wireless access networks in the form of tests, trials, pilot deployments and launches. For more information about Sky5™ LiTE and our comprehensive Sky5™ portfolio, visit www.skyworksinc.com/Products_Sky5 or contact Sky5@skyworksinc.com. Skyworks representatives will be in the Executive Meeting Area in Hall 2, 2G3Ex and 2G5Ex. Skyworks Solutions, Inc. is empowering the wireless networking revolution. Our highly innovative analog semiconductors are connecting people, places and things spanning a number of new and previously unimagined applications within the aerospace, automotive, broadband, cellular infrastructure, connected home, industrial, medical, military, smartphone, tablet and wearable markets. Skyworks is a global company with engineering, marketing, operations, sales and support facilities located throughout Asia, Europe and North America and is a member of the S&P 500® and Nasdaq-100® market indices (NASDAQ: SWKS). For more information, please visit Skyworks’ website at: www.skyworksinc.com. Any forward-looking statements contained in this press release are intended to qualify for the safe harbor from liability established by the Private Securities Litigation Reform Act of 1995. Forward-looking statements include without limitation information relating to future events, results and expectations of Skyworks. Forward-looking statements can often be identified by words such as "anticipates," "expects," "forecasts," "intends," "believes," "plans," "may," "will" or "continue," and similar expressions and variations (or negatives) of these words. Actual events and/or results may differ materially and adversely from such forward-looking statements as a result of certain risks and uncertainties including, but not limited to, our ability to timely and accurately predict market requirements and evolving industry standards and to identify opportunities in new markets; our ability to develop, manufacture, and market innovative products and avoid product obsolescence; our ability to compete in the marketplace and achieve market acceptance of our products; the availability and pricing of third-party semiconductor foundry, assembly and test capacity, raw materials and supplier components; the quality of our products; uncertainties of litigation, including potential disputes over intellectual property infringement and rights; our ability to continue to grow and maintain an intellectual property portfolio and obtain needed licenses from third parties; and other risks and uncertainties identified in the "Risk Factors" section of Skyworks' most recent Annual Report on Form 10-K (and/or Quarterly Report on Form 10-Q) as filed with the Securities and Exchange Commission ("SEC"). Copies of Skyworks' SEC filings can be obtained, free of charge, on Skyworks' website (www.skyworksinc.com) or at the SEC's website (www.sec.gov). Any forward-looking statements contained in this press release are made only as of the date hereof, and we undertake no obligation to update or revise the forward-looking statements, whether as a result of new information, future events or otherwise. Note to Editors: Skyworks and the Skyworks symbol are trademarks or registered trademarks of Skyworks Solutions, Inc. or its subsidiaries in the United States and other countries. Third-party brands and names are for identification purposes only, and are the property of their respective owners.